Once Sochi’s Olympics open on Friday, Canada’s women are quick to the ice, starting the tournament on Saturday against Switzerland. The men face-off with Norway on February 13. Today, hints from history that may or may not help maple-leafed teams find success. Originally published on February 16, 2010, “The Secret To Olympic Hockey Gold” appeared in The Globe and Mail. The Winnipeg Falcons went over to Antwerp in 1920 aboard a ship called the Melita and when they disembarked what they did was win the hockey gold at the Olympics. Of course. I mean, obviously. That’s what Canadian hockey teams do at Olympics, in case you weren’t paying attention. How do we do it? Apart from skating faster than anyone else, passing better, scoring ridiculously good goals? The grit we have isn’t like other people’s, not to mention our pluck. If you could see inside our hearts, that’s what you’d witness, pluck and sinew, pride and gumption — mixed in with the, you know, regular blood. That’s what wins us golden hockey medals — that, and because we’re Canadian and nobody else is. Or so we thought. History doesn’t necessarily agree. That’s worth knowing as we head into our own Olympics. That’s history job: to complicate what once seemed straightforward. History doesn’t like to see a glass of still water sitting on the counter. It just can’t resist dumping in a big spoonful of flour and stirring. I’m not saying those 1920 Falcons weren’t great. Or the Toronto Granites, who won gold in 1924. I have nothing but respect for all those senior teams that used to ship out to Europe to defend our national honour at all those old Olympics and world championships. Belleville McFarlands! Terriers of Galt! Vees and Sea Fleas, Eaters of Trail Smoke! Hats off to all of you. Great work, Whitbyites, Lethbridgers, Pentictonavians! Trounced is the word the newspapers used in 1920 to describe the 15-0 beating we laid on Czechoslovakia, a good word, too, deriving from the Middle English for bouncing mercilessly next to somebody on a trampoline until they fall down and still you don’t stop, even when they say please. We’ve done a lot of that over the years, bamboozling Hungarians by 15, shamwowing the Austrians 23-zip. Early Olympic hockey looks like we were punishing all the novice hockey nations for the crime of loving our game so much, wanting to learn from us, be like us. Not so. In 1920 the Falcons ran practices and clinics for their opponents before games, tutoring before they trounced. In 1924, the Granites schooled the attentive Swiss in the primary hockey principle that if you let us score 33 goals while notching none for yourself, well, that’s going to be pretty embarrassing for you. Exactly. What we also realized was if we were going to do this triumphing properly, what we really needed was to do was develop a set of verbs that truly reflected and paid tribute to the magnificent margins of our whompings. It took a while, this, mostly because of our national inbred Canadian inclination to hold back, not to seem sore in our winning. Though if we were so merciless on the ice, did it really matter how kind we were in print? Topple, overwhelm, stun: all the vanquisher verbs we take for granted now have their roots in those early hockey Olympics. A couple of useful rules of thumb: verbs associated with fairytale ogres marauding through tiny upland villages also work well for big hockey victories, e.g. conquer, smash, crush, squash, quash. The contractor renovating your basement is a pretty good guide, too: hammer, plaster, and shellac. For some reason culinary terms don’t really translate, which is too bad when you consider how the satisfaction involved in speaking aloud words like fricassee and spatchcock. We’d like to think that these Olympics of ours will be decided on merit, and that our alloy of Crosbys, Iginlas, and Brodeurs will provide all the mettle we need to win. And maybe in the future, one day, that’s exactly how Olympic hockey tournaments will be decided. In the meantime, we’ll have to work with what we’ve got. What we know now, after nearly a century of sending hockey teams to Olympics and world championships, Summit Series and Izvestia tournaments, Cups Spengler, Canada, and World, is that hockey adds up to no more than a quarter-measure of the formula that decides these things. Without the other three determinants — nautical, nominal, botanical — there’s only so far that the hockey can carry us. This one is pretty obvious. Does anyone really believe that the 1920 Falcons would have won Olympic gold without Canadian Pacific’s Melita to ship them to Belgium? Where would they have been without it? Saint John, New Brunswick is where. On the voyage out, nobody got seasick. The ship’s carpenter is supposed to have carved all the sticks that the Falcons wielded in Belgium, which is pretty great, if true. I guess the Toronto Granites could easily have steered an overland passage to Chamonix in 1924. And you know what? They probably would been better for it, just in terms of bonding as a team and, you know, generally toughening themselves up as they trekked the sea-ice between Alaska and Siberia, cutting down to meet antiquity’s Salt Road, on to the Silk Route, quick left at the road to Damascus, straight on through via the Appian Way and the Path of Righteousness. Instead they shipped over aboard Montcalm. How much does the quality of the ship matter in Olympic outcomes? What about the crossing itself? Good questions. Some will say that in 1928, when the University of Toronto Grads went over for the St. Moritz Olympics, the Red Star liner Arabic was still a year away from the refit that put in new staterooms and gymnasium, electric elevators. And yet the Grads still won the gold going away, traducing Swedes, Swedes, and Britons by a combined score of 38-0. Though it is true that the Port Arthur Bearcats, in 1936, had a terrible time on the way over to Liverpool aboard The Duchess of Atholl, also known as the Rocking Duchess. Herman Murray was sickest of the bunch, which maybe he saw as taking a leadership role — he was team captain — though it may just have been his breakfast reacting to Atlantic wave-action. What about the 1955 Penticton Vees? I know. They flew over to Germany aboard a big Trans-Canada Airlines Constellation and came back world champions. But I’m talking here about Olympic gold medals, and the hard facts are that of the seven we’ve won, teams that have travelled by air have won the same number as those that took the train, which is to say a paltry one each, whereas when we’ve gone big and waterborne, we’ve won five. The numbers don’t lie: our winningest way to the Olympics has smokestacks and flags and ring buoys to toss in case of goalies overboard. Science has made huge strides when it comes to hockey in recent years and also, you know what else? Inroads. From Malcolm Gladwell we’ve learned that if Sidney Crosby wanted to be really great, he should have been born in January instead of August. Bob Sirois has shown how the NHL is allergic to Quebeckers. And a whole bunch of people not named Don Cherry have made what can only be called headway in the area of concussions. And yet science has had exactly no luck, to date, isolating the genome that explains what makes Bobbys so important in the hockey context. Genome? I may mean isotope. Either way, somebody soon will come to crack the code: until then we have to rely on good old Canadian guesswork. What we know is you have to have one. In 1920 it was Bobby Benson playing left defence, that’s where it all started, though we didn’t necessarily know it at the time. Benson wasn’t the best of the Falcons, he was no Mike Goodman, what he contributed was a certain, well, Bobbyality that is, frankly, almost impossible to define, quantify, distill, and/or decant. You know what I’m talking about. I guess it’s as much a condition of mind as a set of skills, a willingness block shots and lose teeth and play hurt and also to swing your stick like a crazy woodchopper just in case the national interest might be served by someone’s ankle being broken. I know what you’re thinking and yes, it’s true: the 1924 Granites had a Stuffy and several brothers Plaxton, but no Bobby. They still won. What about the Grads in ’28? Also Bobby-free. That’s the thing: our Bobbys aren’t always named Bobby. Ryan Smyth, for instance, is a pure Bobby, other than his name. Shane Doan, too. Here’s my best guess: other than ’72, we’ve been careful to husband our Bobbys. My own theory on this is that very quickly we realized the danger of overt Bobbys was (a) they’re easy to identify and neutralize and (b) assuming as we must that the words proprietary technology mean nothing to Finns and Latvians, what’s to keep them from filching our Bobbyness and applying it to all their young Miikas and Kimmos and Anttis? This year? I wish I could tell you who our Bobbys are, but I’m not allowed. Let’s just say I’m not worried. Which is more than I can say about our leaf. The 1920 Falcons wore sweaters the colour of queasy mustard, though officially the colour may be closer to a goldenrod or a gamboge. At the time it was described as “old gold” — I guess to help the team recall what they’d come for. 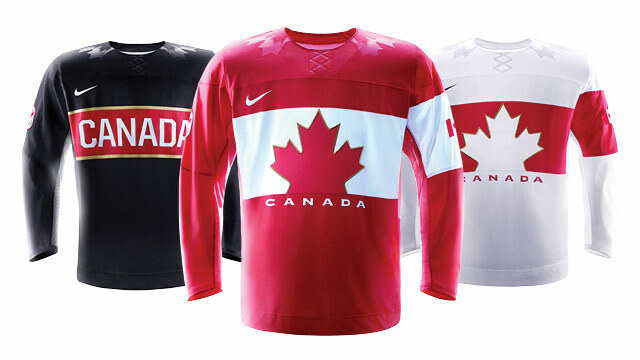 Since then, Canada has worn white sweaters to Olympics and world championships and they’ve worn red. Some years, like 1948, the sweaters turned air-force blue. All of which is to say: the colour of our sweaters has no bearing on how we do. History is clear on this. It’s the maple leaf that’s vital. The leaf reminds us where we live and also, for those of us residing north of the treeline, where we don’t live. That’s how versatile the leaf is, emblematically. It speaks of our nation’s natural beauty, it alludes to our favourite syrup, it reminds us what we’ll be raking when October comes again. The beaver has its place, too, obviously, except that the male of the species has been dogged since ancient times by the disturbing — legend? rumour? fact? — that when pursued by predators he will sometimes chew off his testicles as and leave them for his pursuer in the way of (as one Greek writer put it) a man pursued by thieves forfeiting his valuables by way of ransom. Maple leaves don’t do this, and nor does hockey. I’d venture to say that’s one of things we love about the game: hockey, when pursued, retains its testicles. But. The leaf. The Falcons had one of the best ever, if you ask me, 49 points, hungry-looking, lean and spiky, a bit of an austerity leaf, I guess, with the war just over. Whereas Winnipeg’s 1932 leaf was gorged to bursting, like a leech after lunch. You know who else had a good leaf? The East York Lyndhursts from 1954. Though the Soviets did schmuck them, in Stockholm. Which shows you can’t be too careful. In 1972 we wore a leaf so big it didn’t fit on the sweater, the players looked as though they were being swallowed by the leaf. Unless it was meant to be a sawblade. To scare the Soviets? 1976, the Canada Cup, was another mega-leaf, though this time sliced in half, perhaps in memory of all those national leaves run over by lawnmowers. 1977 ushered in a three-year reign of what must be the ugliest leaf ever, yellow, red and green, it looks like neon leaf from a terrible dive of a bar, just a travesty of a leaf — and most of the teams that wore these ones responded with like-minded performances. In 1996 a man appeared within the leaf, bisecting its two halves, one of red, the other black, probably to represent the blood we shed playing hockey and our bad moods, respectively. Which gets us to Vancouver. It’s late, I know, to be second-guessing Steve Yzerman, and possibly even unCanadian. Still, somebody should be saying it, and if not now, when? As I’ve said, it’s a leaf problem. To me, looking back, the leaves that appear to have been freehanded by bright kids with crayons and their tongues sticking out to help them concentrate, those are better than the ones, like this year’s, that appear to have been rendered on computers by robots. Eleven points, decorated with interesting animals and doodles. It’s not awful — what’s there. And that’s what’s so worrying. The real problem here is — well, let me ask you a question: how many Canadian teams have ever won Olympic gold wearing a maple leaf that lacked its petiole? Exactly right: none. A leaf can’t do with a petiole, so why would we assume that a hockey team could? It’s crazy. People I’ve talked to about this, some of them, they don’t see the danger. I’ve been told to stop being so botanical about the whole thing. Okay, okay. The stem. Where’s our stem? It’s not just that it looks incomplete, which it does, what I’m talking about here is the brazen arrogance that makes us think we can win hockey gold without our petiole in place. It’s almost 1972 in its magnitude. How do you think a feeds itself? Or shifts to catch sunlight? When winds blow the petiole twists the leaf and turns it without letting go. A leaf without its petiole — how would that work? It wouldn’t. It’s too late to fix the sweaters, obviously. Bobbywise, as I’ve said I don’t think we can do more than we’ve already done. Which puts a lot of pressure on the hockey. Unless — I guess the easiest fix might be to get the team over to Halifax as soon as possible. Checking on the ships in port … the Farley Mowat’s there, and also Antwerpen Express. Or if the hockey players didn’t mind asserting some quick sovereignty along the way, maybe the Navy wouldn’t mind sparing HMCS Ville de Quebec to take them up through the Northwest Passage and on, full steam ahead to Olympic glory. It may be our best chance, at this point.